Word of mouth is a potent ingredient in craft brewing, the fastest-growing segment of U.S. beer making. Defined as producers of fewer than 6 million barrels annually, craft brewers tend to share best-practice tips with the same enthusiasm that beer lovers have for the unique brands and flavors they create. The Captain Lawrence Brewing Company leans on its new boiler’s faster startup time, which they report as roughly three minutes, to get more done each day. 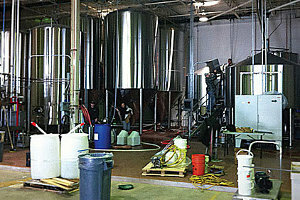 Vaccaro chose a compact, gas-fired Miura LX-50 for his family-run Captain Lawrence Brewing Company, which produces a line of award-winning ales distributed throughout Connecticut and the lower 15 counties of New York State. Named after a Revolutionary War hero, Captain Lawrence projects an output of 15,000 to 17,000 barrels this year with the recent addition of 12 oz. bottles for retail sale. Most essential to this small company, however, is the dependability of its Miura LX-50, which enables Vaccaro and his team to concentrate on what they do best. Because Miura’s unique once-through fintube design burns less fuel, it also reduces emissions. Miura boilers output reduced levels of nitrogen oxides (NOx), a major contributor to air pollution, as well as CO2, the most prevalent of greenhouse gases. Miura boilers achieve low-NOx performance by reducing the temperature of the boiler’s flame, which in turn reduces the amount of excited nitrogen atoms available to bond with oxygen to form nitrogen oxides. As a result, NOx emissions are reduced to around one-quarter of what traditional fire-tube boilers emit. This enables Miura boilers to comply with even the most stringent air-quality regulations. With regard to reduced CO2 emissions, Miura’s technology leverages superior operating efficiency to contribute significant carbon abatement with a payback. In addition to its fintube design, every Miura boiler also features the BL Micro Controller, which keeps track of multiple individual monitoring points. An advanced diagnostic system, it can identify any potential challenge to smooth operation and recommend a solution on an easy-to-read display. A “sliding-window feature” records events four seconds before they occur for fast and effective trouble-shooting. This system can also be accessed via the Internet using the Miura Online Maintenance (“MOM”) feature for remote monitoring and diagnostics. The system can also interface with Miura’s Colormetry feature, which monitors water quality to prevent the build-up of scale inside the boiler. Yet another benefit of Miura’s design is a compact physical size. Although smaller, however, Miura’s exclusive technology produces bhp outputs comparable to much larger units.